I am happy to report that we arrived safely in Maine late Tuesday night! The drive went really well and the kids were all on their best behavior! I think David and I *finally* have a routine & system worked out to get us through the 22+ hour drive with our sanity intact! This morning we woke to a beautifully perfect summer Maine morning with the sun sparkling on Casco Bay! Just stunning! We were able to take the kids to the beach today, with it being Ethan’s first experience with sand and he loved it! Did you stop over to the Blog Hop tonight to see what everyone has been up to? This month’s challenge was to play with acetate (a.k.a. transparencies) and everyone came up with such AMAZING ideas! (You can see a list of everyone’s links HERE!) I didn’t have a chance to complete a project before leaving on vacation, but I thought I would bring our my favorite transparency card from the past! To this day this is still one of my favorite creations ever! It uses the fantastically versatile Piece of Cake stamp set along with the white sheer blossoms we carry from Maya Road (you can read ALL the details about this project in the original post HERE). 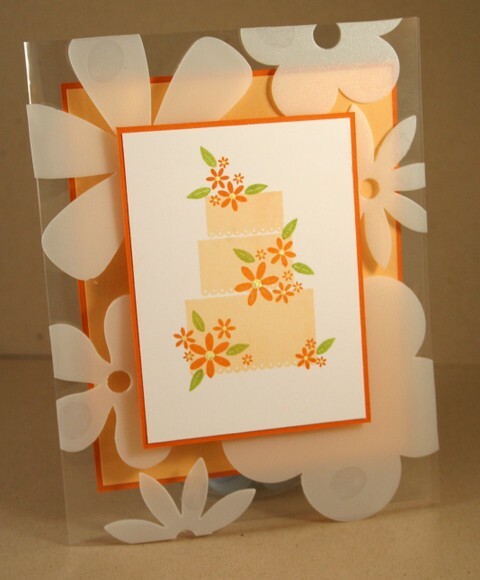 Think of all the other fun things you could layer on an acetate card base in place of the flowers… punched shapes from a variety of cardstocks or patterned papers, die-cut shapes from hundreds of different materials, page pebbles, and the list goes on and on! Even if you didn’t participate in the Blog Hop tonight, I hope you will try your hand at working with acetate! It’s such a unique material that can be used in SO many ways! Enjoy the rest of your week and happy stamping! Just happened to stop by your blog and see this pretty card! I love what you’ve done with the flowers, so creative! Incredible. I love the flowers on the acetate. Loved the Blog Hop. Enjoy your vacation. Glad your having a nice time! Love the card! Seriously – I had to laugh on the best behavior – that is the “lecture” we give the kids every time we go away somewhere…. How quickly we forget! I had TOTALLY forgotten that card! and I LOVE it! I participated last night for the first time and had such fun. I’ve lurked for the last few, but I actually got in there this time–I saw some great ideas to try with acetate! Thanks for encouraging us to play with it! Welcome to my beautiful home state of Maine!! Yesterday WAS just a gorgeous day and today is proving to be just as wonderful!!! We used to own a sailboat and did alot of sailing around Casco Bay! I live in Scarborough. There is no place like Maine to relax and rejuvinate yourself. Enjoy with your family!!! I’m glad you arrived safely in Maine. Can you share some pictures of the surroundings on your blog while you are out there? I have always wanted to go to Maine. While growing up, did you read the books “Blueberries for Sal,” “One Morning in Maine” or “Make Way for Ducklings” by Robert McCloskey? I know you are on vacation but for those of us that can’t take one this year, please share some photos of your time. I would love it! Thank you! IMO, any books by Robert McCloskey are fabulous. Beautiful card!! What adhesive did you use to adhere the flowers? Oh my…no wonder it’s a favorite. This is stunning! I missed this the first time, thanks for re listing it. Its sooooo beautiful,acetate is so difficult and you do it so well. Oh wow – great card! First card today that made me OOH. I love the card, the colors, the transparency, the design. Have enjoyed this creation since day one it is stunning. Have a wonderful vacation! Just wanted to say I love this card, and a lot of the cards on your blog. Very inspirational. OH I LOVE this card too! Thanks for the “second look”! 🙂 Have a great time! It was great to see this oldie but goodie! I love it as much now as I did when you first did it. Such a happy card! I am having trouble logging into the forum. Who is a contact in order to get help. Love the card and the pictures of Maine but what has happened to your store website – cannot get in there to look and shop? You are so clever! Love the card. Nichole – hope you are enjoying being back here in Maine – unfortunately our weather has not been so great – the only sun I’m seeing is during the day when I’m stuck in the bldg at work. If you happen by the Old Port, and are on Commercial Street, I’d love to just say hi – I work at 100 Commercial St Ste 410 – work email is irene@sigcap.com. Enjoy your vaca and hope the family is having a blast.